Light cream with SPF 30 reliably protects the face of the skin from damage by UVA and UVB radiation. It prevents aging of the skin, it gives it hydration and nutrition without damaging the pores. It contains only mineral UV filters without nanoparticles. 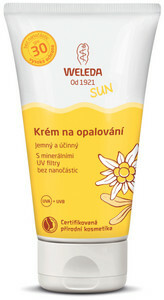 The sunscreen provides high protection against UVA and UVB radiation immediately after application. Thanks to its composition with BIO extract, it strengthens alpine, coconut and jojob oil before skin aging, moisturizing and nourishing without damaging the pores. Gently apply to all parts of the body before sunbathing. Allow the product to fully absorb into the skin. Apply repeatedly to protect the cream well, especially after swimming, wiping or sweating. In order to provide permanent protection, the cream should be applied again, as the effect of water or sweating decreases. Avoid contact with clothing. *Water, Titanium dioxide, Jojoba oil, Alcohol, Glycerin, Coconut oil, Polyglyceryl-2 Caprate, Sorbitan stearate, Unsaturated fraction of olive oil, Sucrose stearate, Stearic acid, Alumina, Sclerotium rofsii, Xanthan gum, Glyceryl caprylate, Squalene, Cocoate of Sugar, Fragrance *, Limonen *, Linalool *, Citronelol *, Benzyl Benzoate *, Benzyl Salicylate *, Geraniol , Citral , Farnesol.